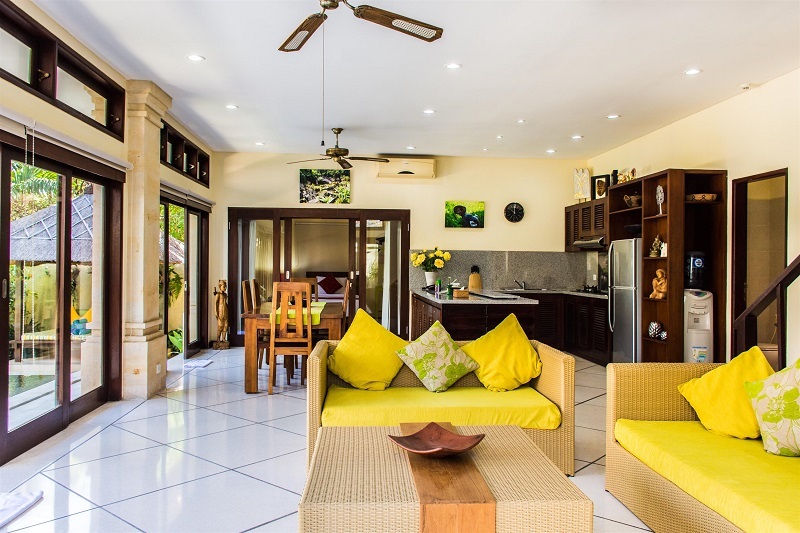 We have stayed at numerous Villa Bugis rentals and once again this villa did not disappoint….staff were as usual amazing and were very helpful, friendly and go well out of their way to help you. 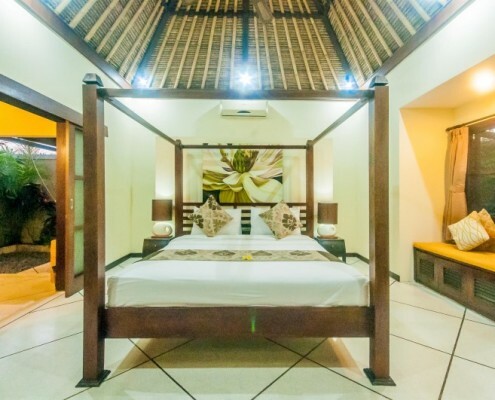 We love loved our stay at Villa Gading. 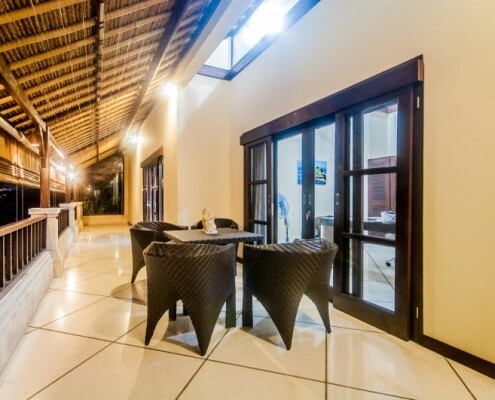 Perfectly located a short walk to the beach, no nightly noise, quality food close by. 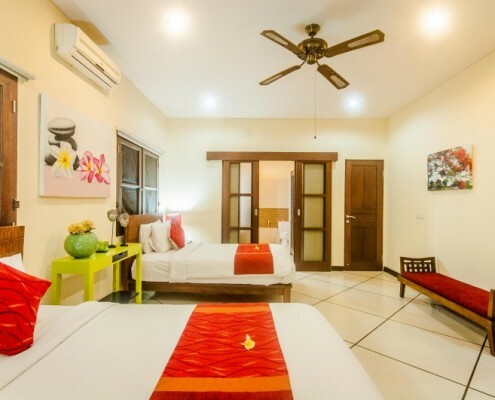 My husband and I have recently stayed in Villa Gading at Seminyak. 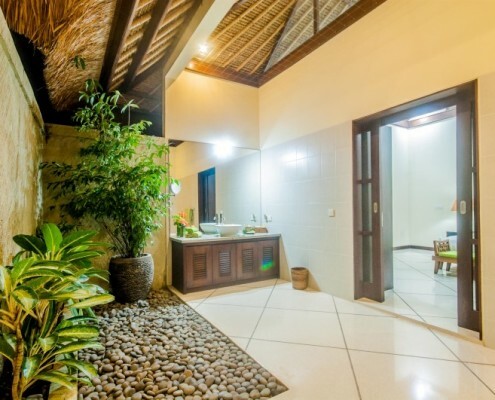 This villa is so relaxing with such a wonderful ambience. 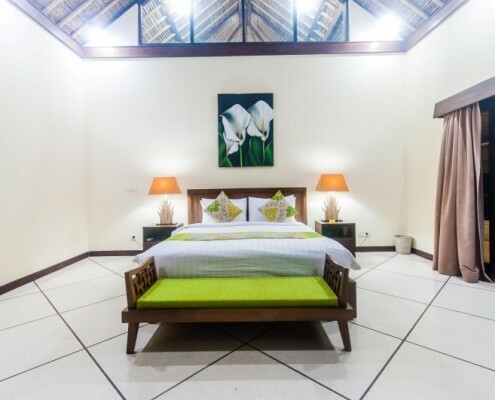 The garden has beautiful orchids which were flowering during our stay. 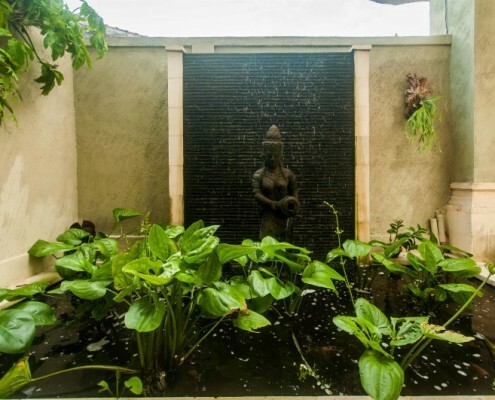 The waterfall and fishpond creates a very relaxing atmosphere. 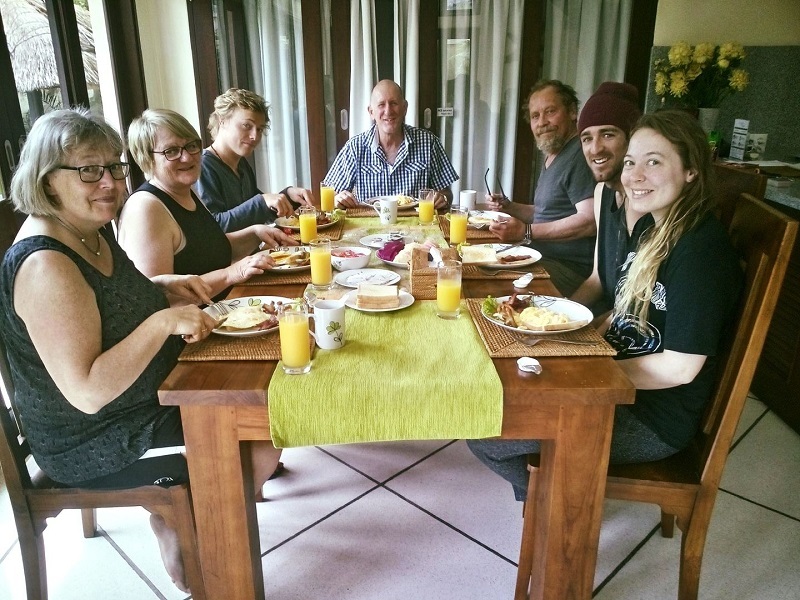 Yes – we came back for a second stay, and I’m sure there will be more! 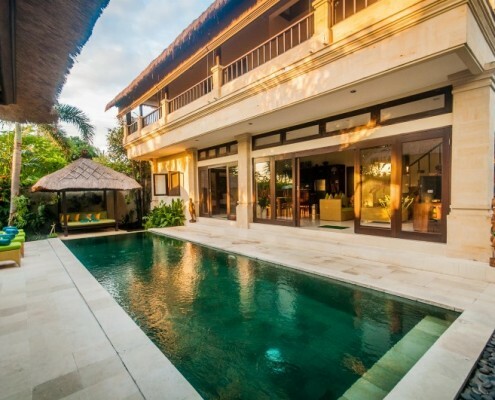 Beautifully maintained by Villa Bugis, this property is the ultimate luxurious, private holiday accommodation, and so close to all Seminyak has to offer – beach, restaurants (so many of them! ), shopping, it’s all at your door. 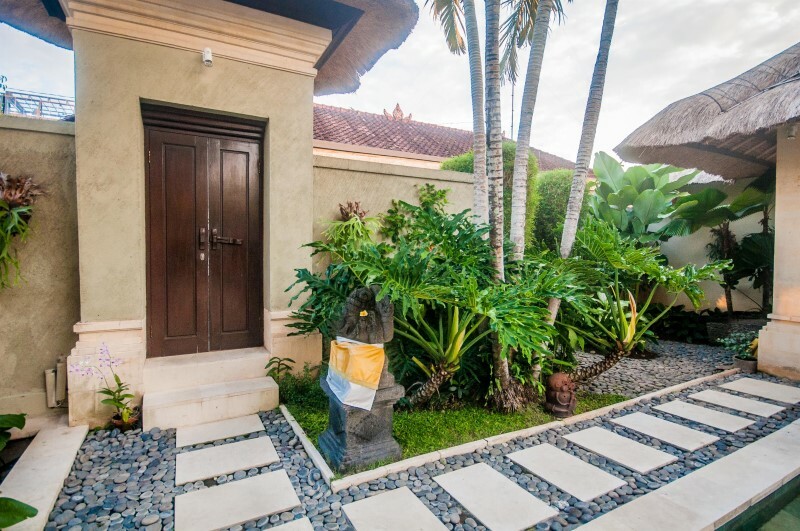 From the moment you walk through the wooden entrance into Villa Gading it is obvious you have found a very special place to stay in Bali. 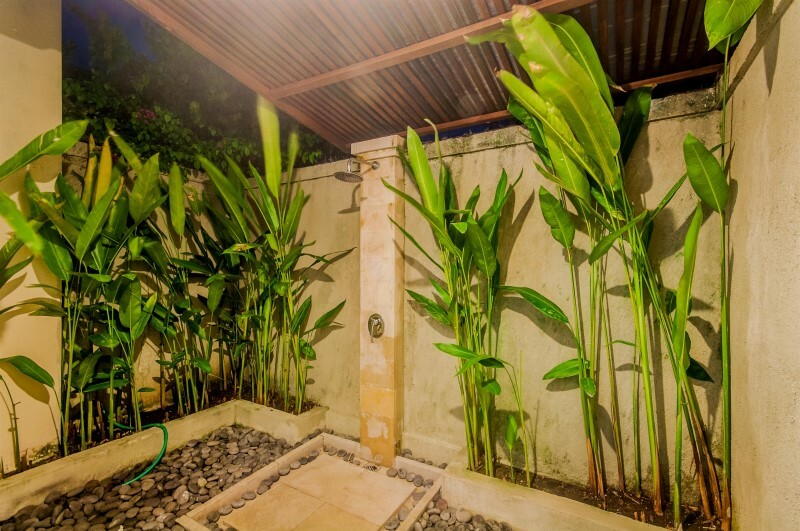 The busy street noise of Seminyak is left behind once you are inside this property. 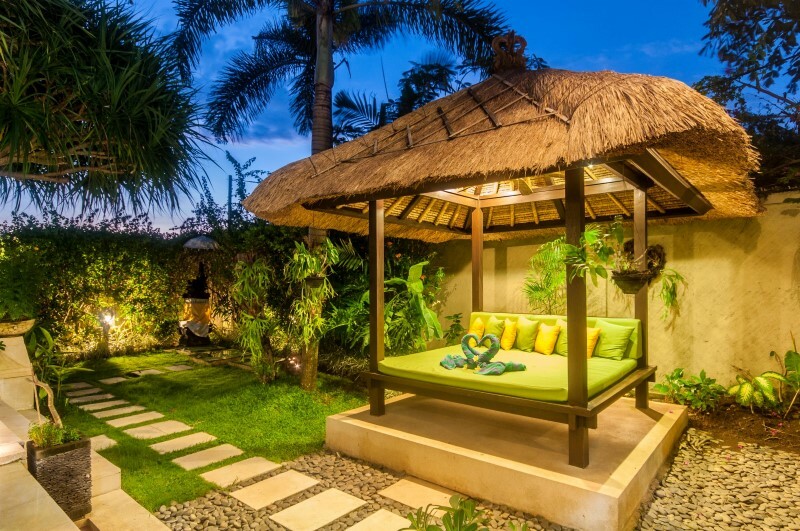 Our Bali private pool villas include Villa Gading. 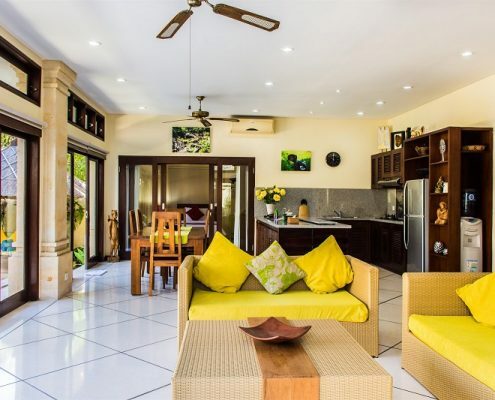 This spacious two-story villa has three bedrooms, a large infinity pool and lush tropical gardens. 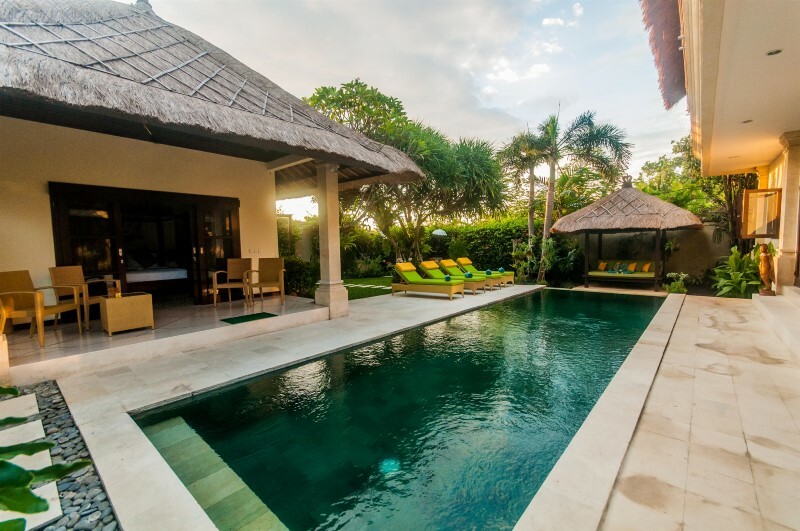 The villa blends modern comforts with traditional Balinese design. 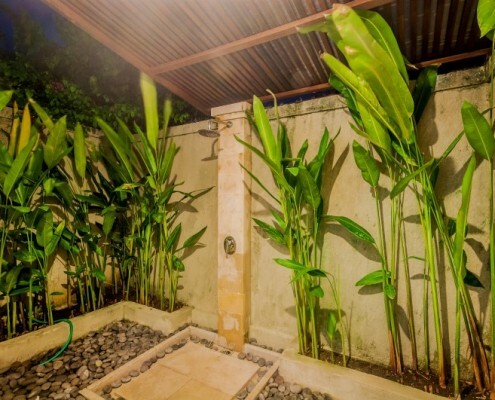 At the end of the gang it is the perfect situation and away from street noise, yet close to the centre of Seminyak. Most things you would want to do on your holiday, eateries, shops, spas and galleries, nightlife and the beach are within easy walking reach. 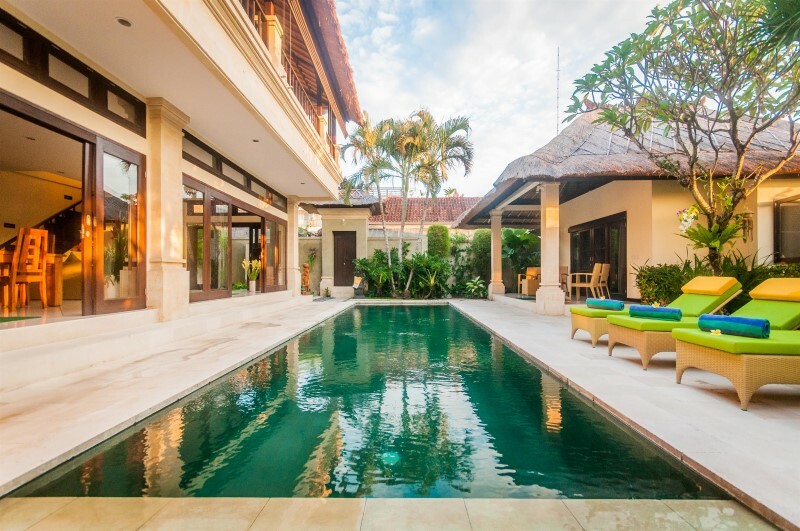 Villa Gading creates the ambience of a traditional Balinese compound, and a perfect choice for a family or group of friends. 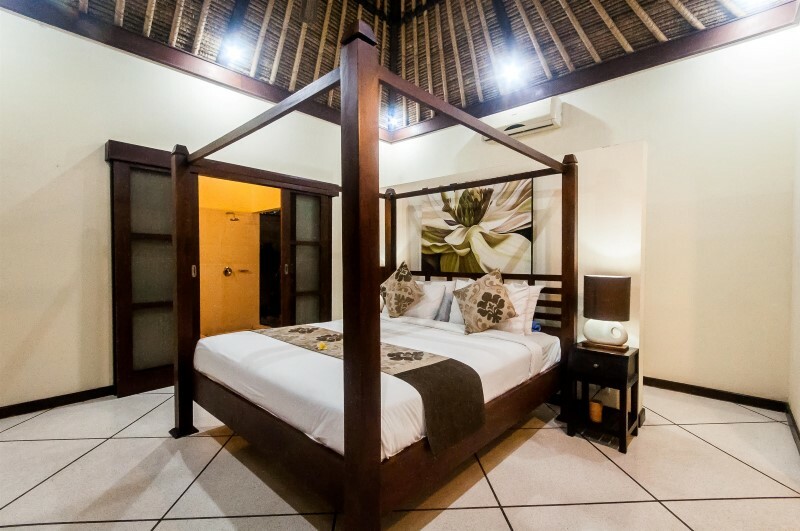 Upstairs the main bedroom is air conditioned and fanned and opens onto the balcony. 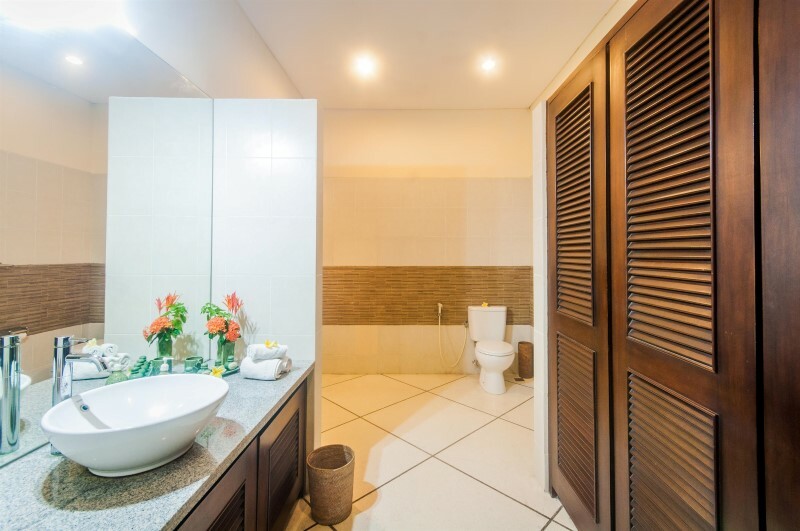 The bed is king sized and there is a safety deposit box in the wardrobe and a large ensuite with a shower and wash basin. 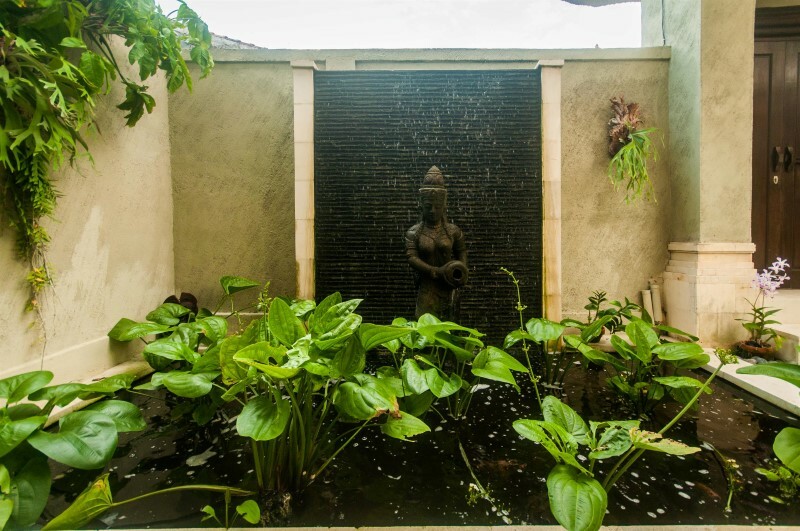 As you enter Gading you are greeted by a standing Ganesha to bring you health and good luck. 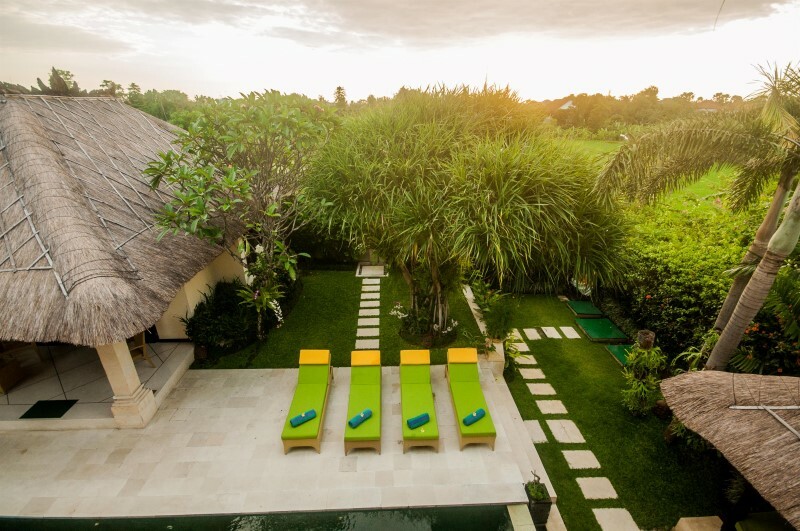 The villa is situated down a quiet Gang off Jalan Drupadi called Kubu Carik (meaning a small house in the rice field) and overlooks these largest remaining rice fields in Seminyak. 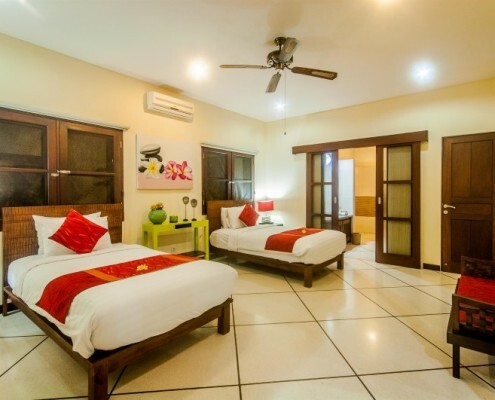 A short walk brings you to Jalan Drupadi, Kayu Aya (Laksmana, or ‘Eat Street’), and the centre of Seminyak, a fashionable area with an abundance of boutique shopping options, numerous restaurants, spas, art galleries and night clubs and the close ubiquitous beach where you can watch the ocean swallow the sun. 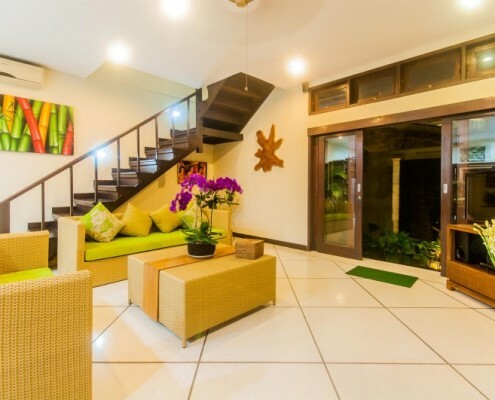 Well, there we were again, on our 3rd stay at Villa Gading in as many years! 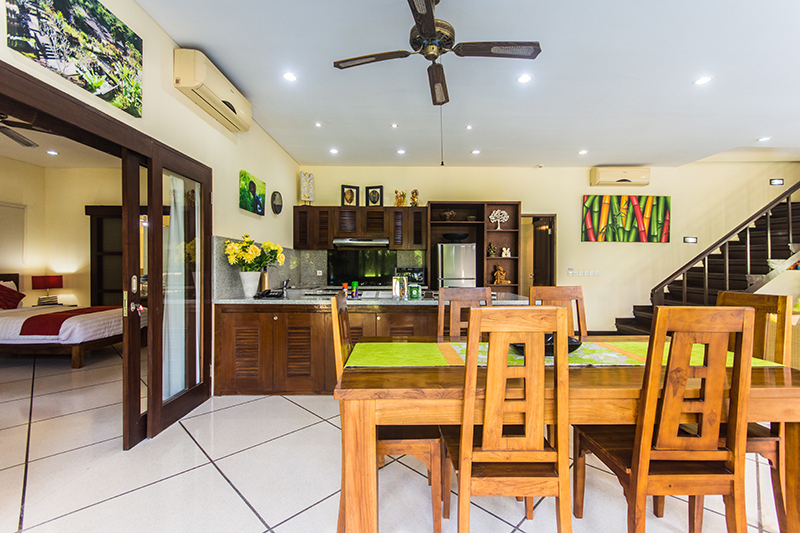 We just love this villa – so well located to everything, especially the variety of eateries from fine dining to quirky warungs, and many within an easy walk. 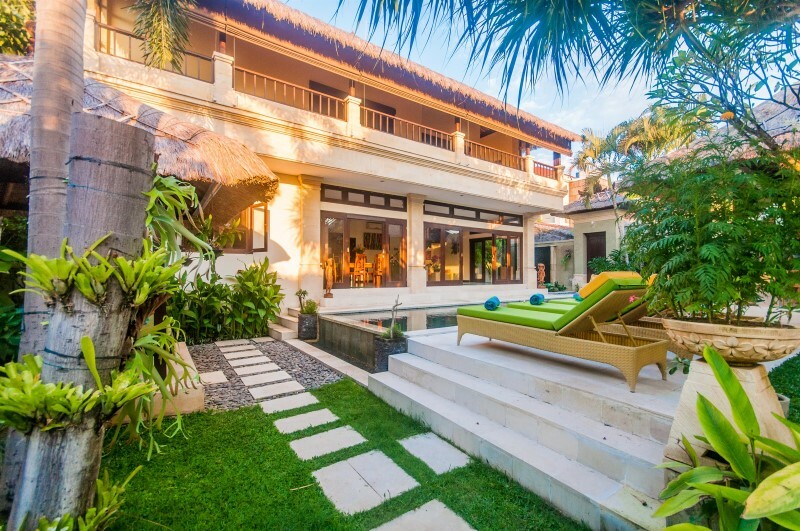 It’s only a short walk to the beach for a sunset cocktail sitting on a colourful bean bag – or if you are not so inclined, the sunset from the first floor of the main villa is amazing. And having the sole security gate access at the end of the gang makes getting around so simple and safe. As always, we look forward to enjoying the personal touch added by the owners, and it is always fun to check out what has been done. 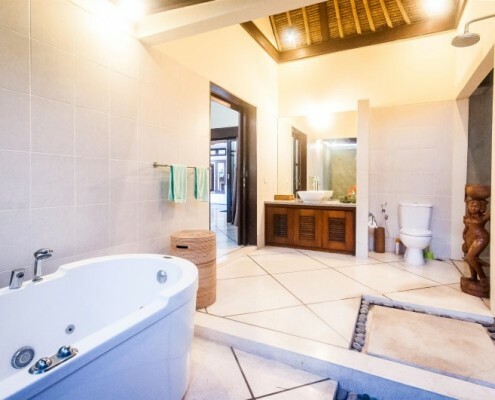 This time there was a new marble kitchen top (very chic), along with new bathroom towel rails, extending bathroom shaving mirror, beautiful new orchids in the lush garden and many new fish in the pond. 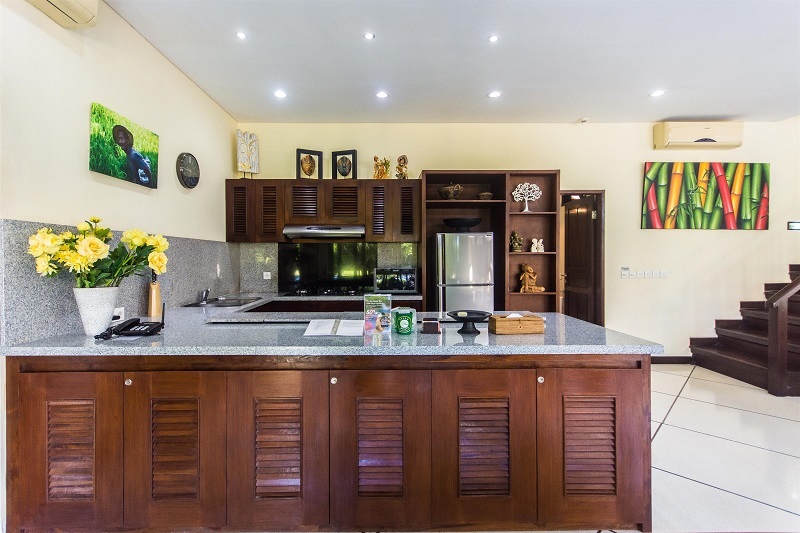 It is such a pleasure to stay in a villa that is well tended – it says so much for both the owners and the managing agents. 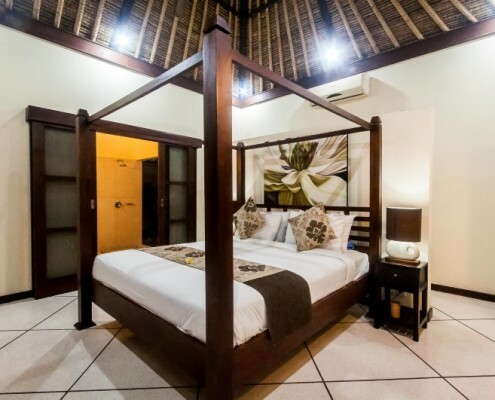 A stay in this lovely villa will leave you invigorated, and ready for a return visit. 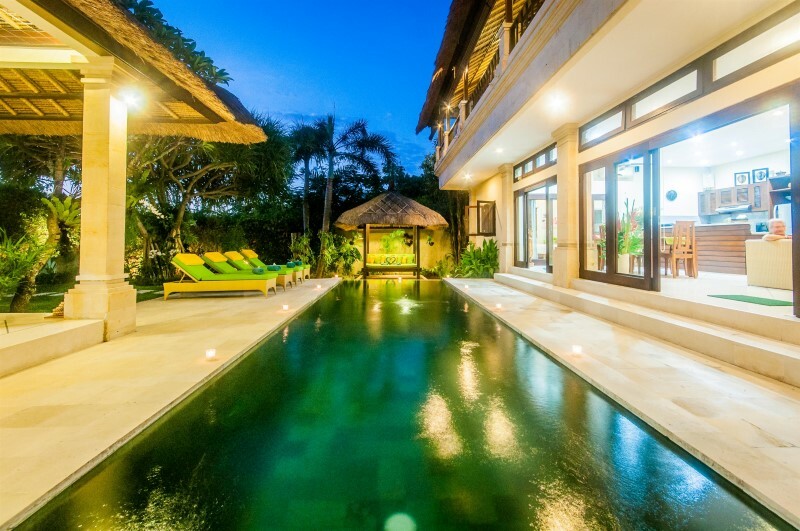 We stayed at this villa with 2 other families. 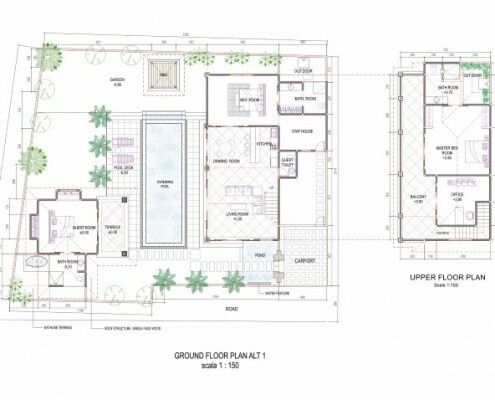 Very well laid out and clean. 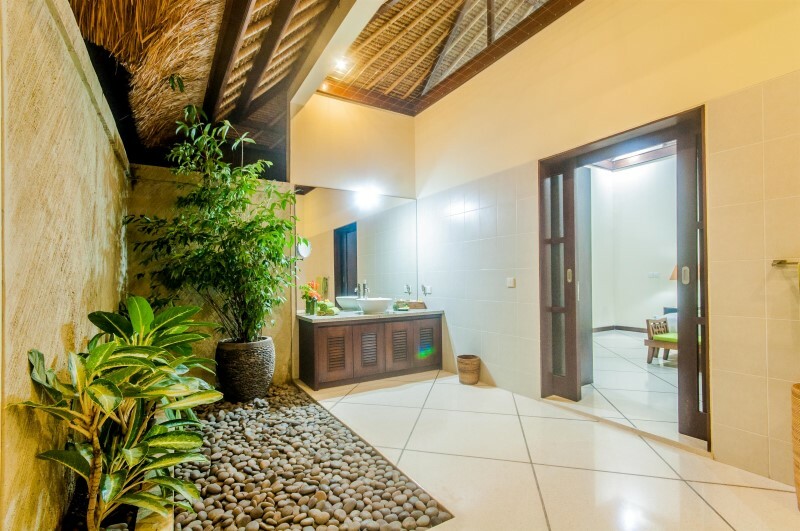 Toddler friendly pool and lockable main living area. 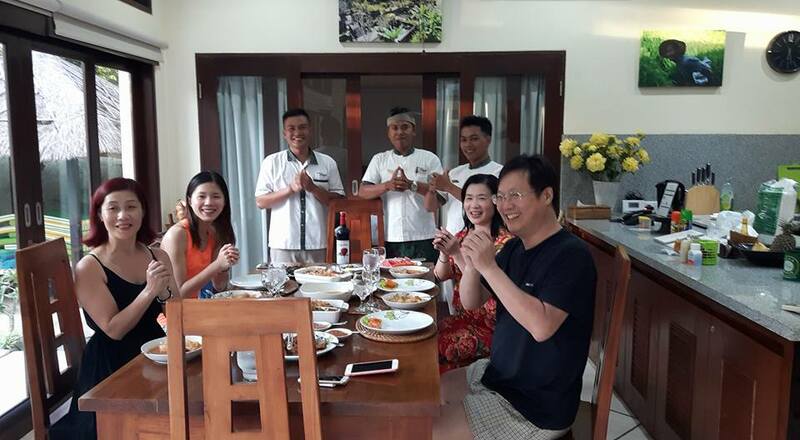 The staff were fantastic as usual (4th stay with Villa Bugis) and the location is perfectly central to everything you might need. Highly recommended for large groups/families. 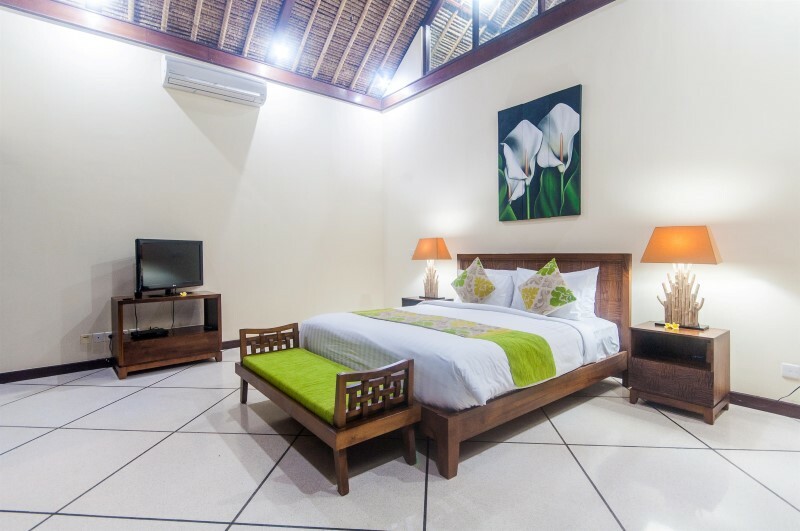 The villa has everything that a guest could want and the quality of the furniture and furnishings are very high. 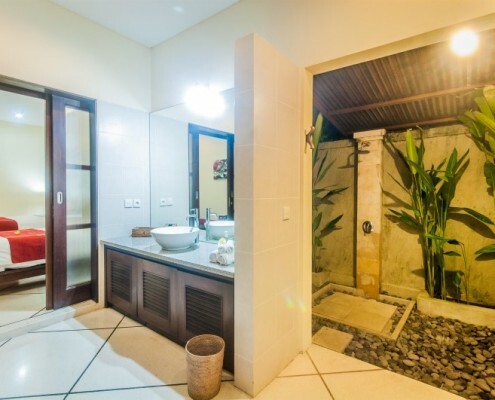 I would recommend this villa to anyone who needs to relax and enjoy Bali. 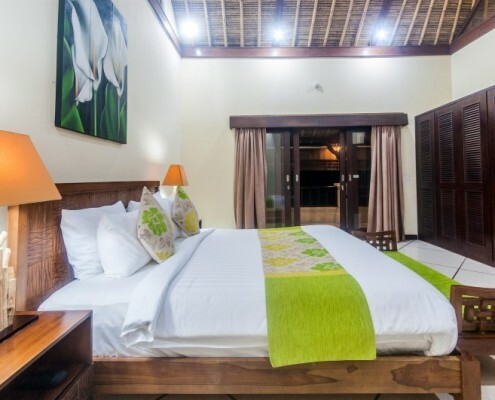 It is close to a lot of good restaurants and taxis are within easy access – just a short walk across the rice paddy which is accessible via a gate. Yes – we came back for a second stay, and I’m sure there will be more! 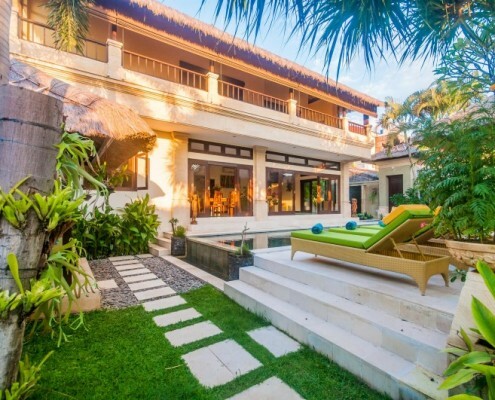 Beautifully maintained by Villa Bugis, this property is the ultimate luxurious, private holiday accommodation, and so close to all Seminyak has to offer – beach, restaurants (so many of them! ), shopping, it’s all at your door. 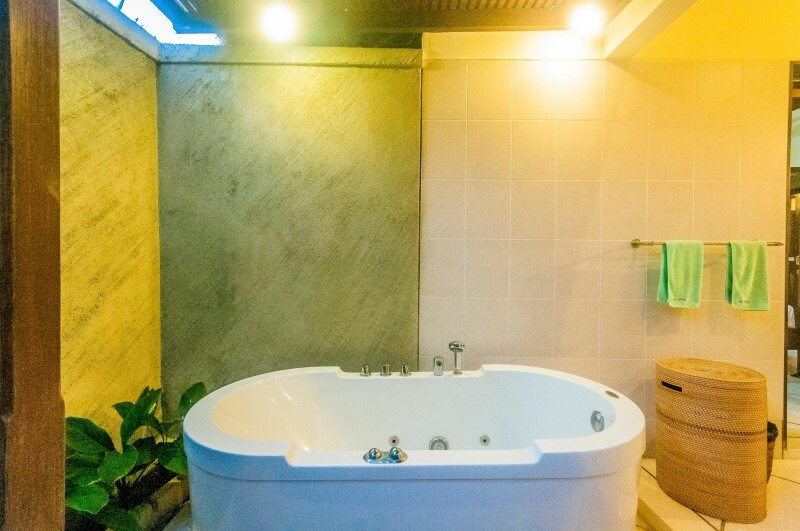 The owners are constantly adding personal touches (love the wall features that are new since last visit – some are from photos taken by the owners!) 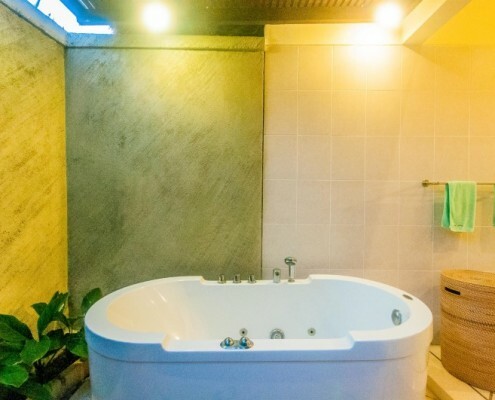 which makes it obvious that they are passionate about keeping this a sought after property. 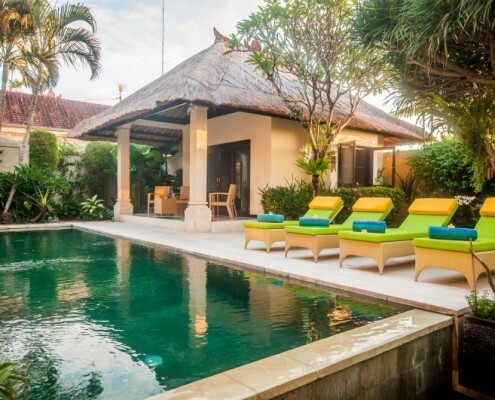 Oh, and did I mention Villa Bugis? The kind of Management Company you need to look after a property of this calibre. Check it out – you won’t be disappointed! 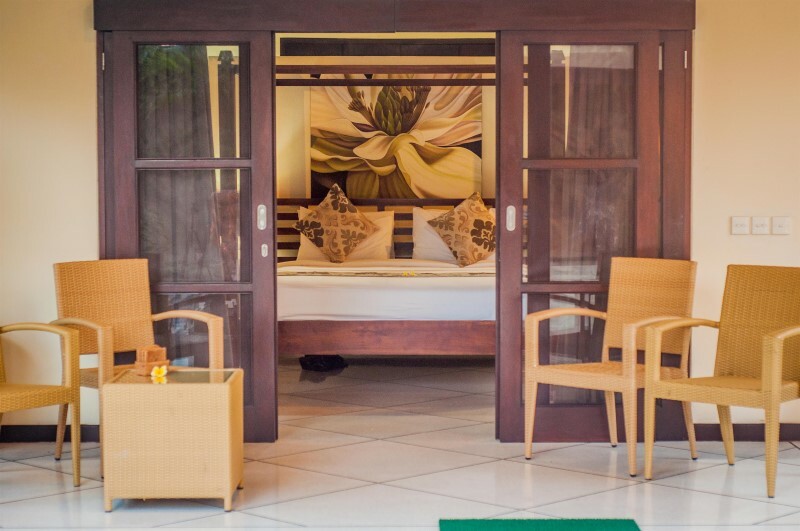 From the moment you walk through the wooden entrance into Villa Gading it is obvious you have found a very special place to stay in Bali. 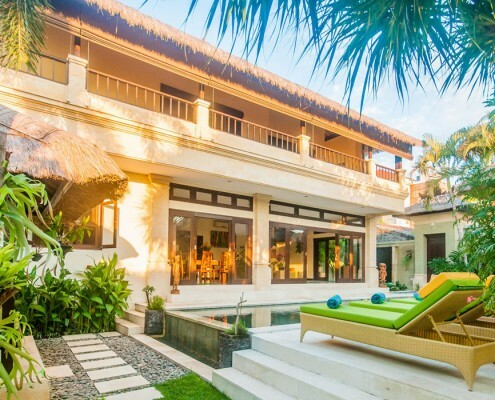 The busy street noise of Seminyak is left behind once you are inside this property. 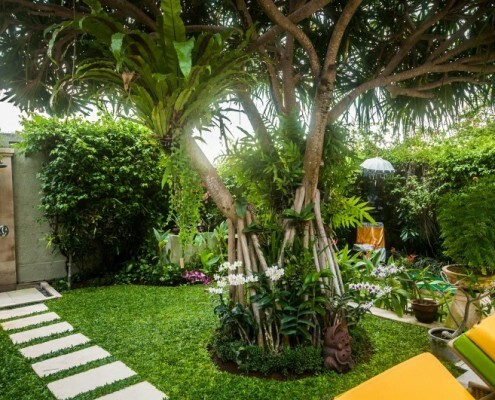 The garden is immaculate and tranquil. 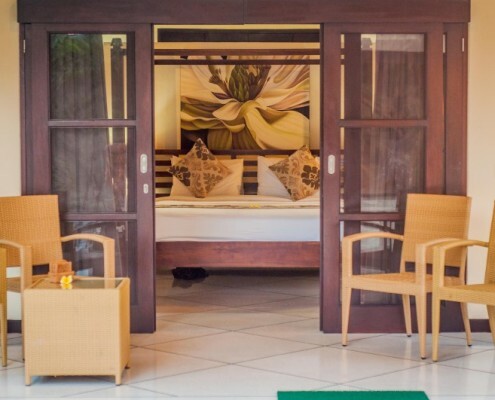 It is simply bliss to relax by the pool with a selection of shaded and sun areas to choose from. 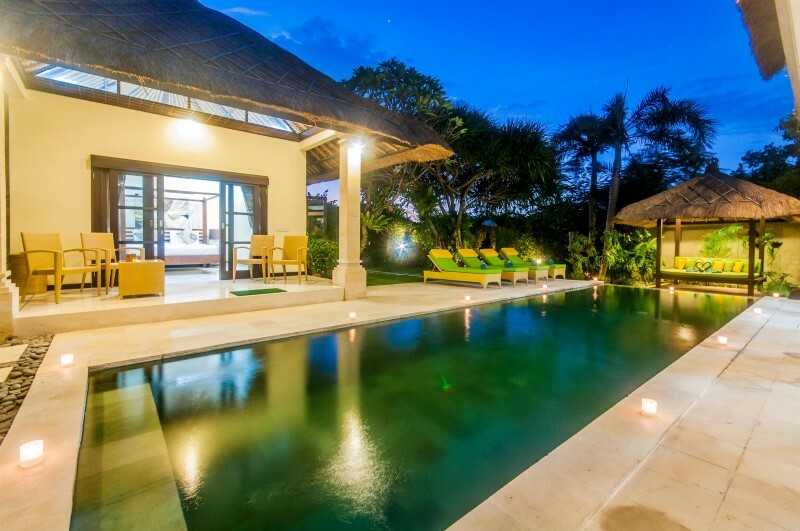 The bale is a favourite place to comfortably read and relax to the sound of the water from the infinity pool. 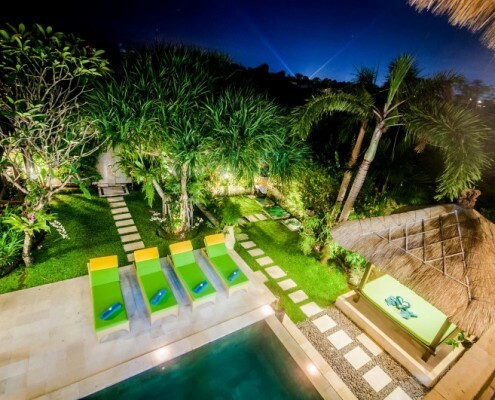 When you look up from reading, wow what a beautiful view of the pool and garden, an exciting reminder you are in Bali. 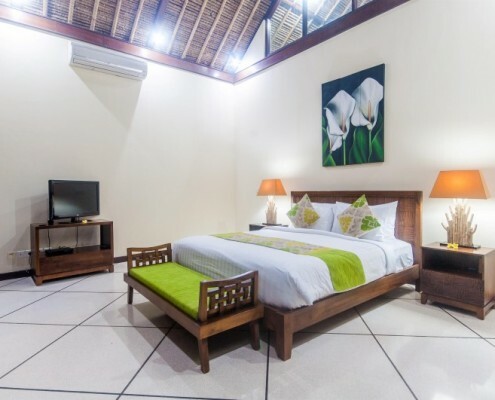 This villa has been thoughtfully decorated whilst incorporating Balinese culture. 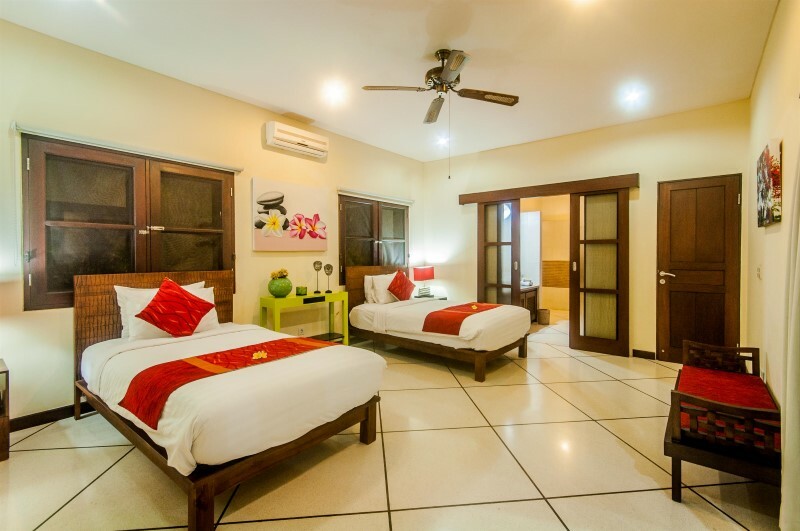 Everything that we needed to make our stay comfortable was offered at Villa Gading. 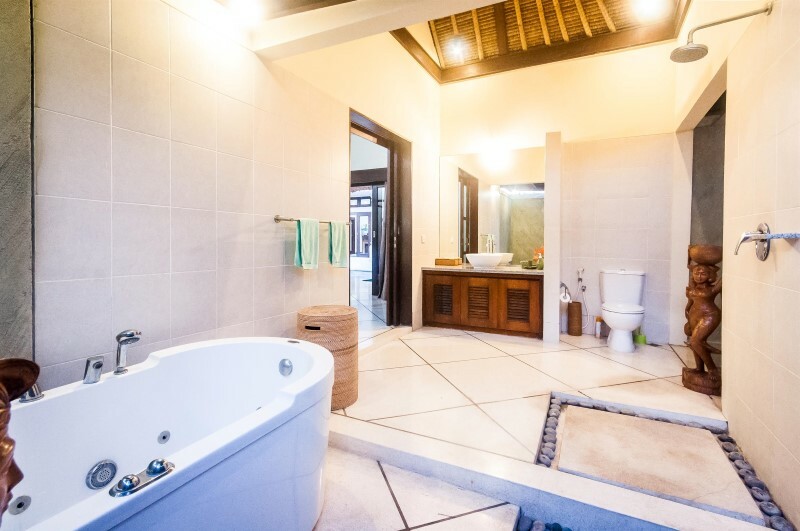 The design of the villa allows all guests a relaxed environment with space and privacy. 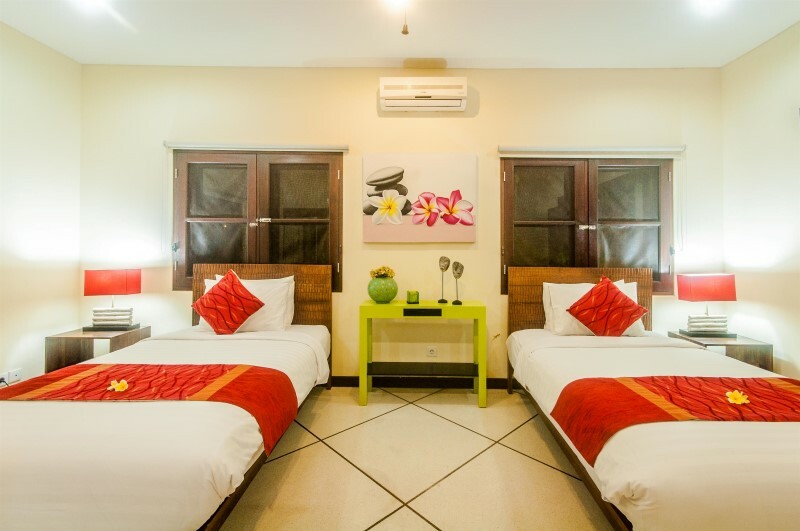 The staff from Bugis are superb, this is the third time my family and I have stayed at Villa Gading. 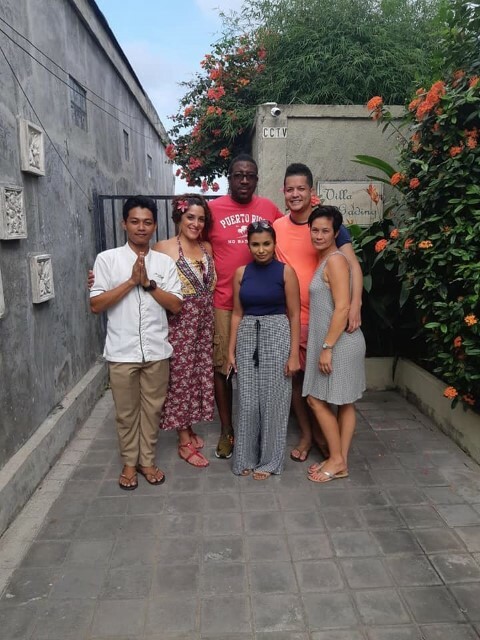 Every time we arrive the staff welcome us so genuinely and continue to treat us as their special guests throughout our entire stay. 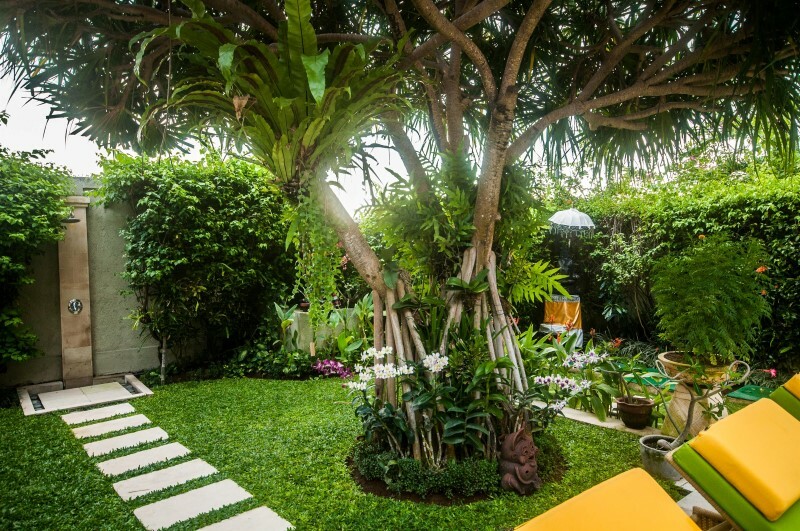 Villa Gading is a delightful place to stay and be indulged in Balinese living. 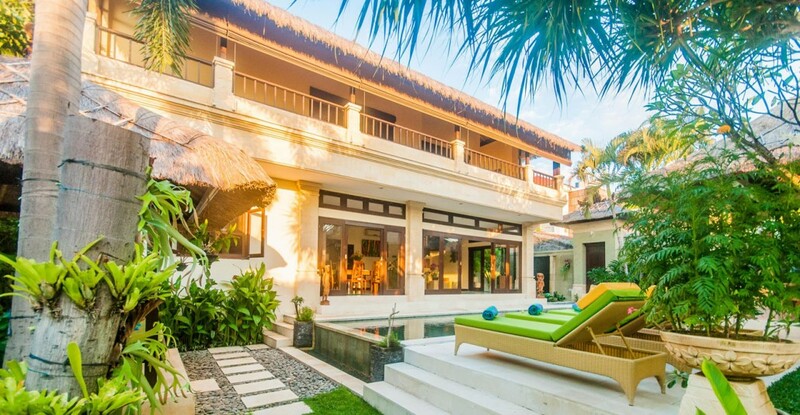 A little piece of paradise in Bali. Please say hello to all the staff at Bugis. I would love to keep in touch with you until our next stay in Bali. 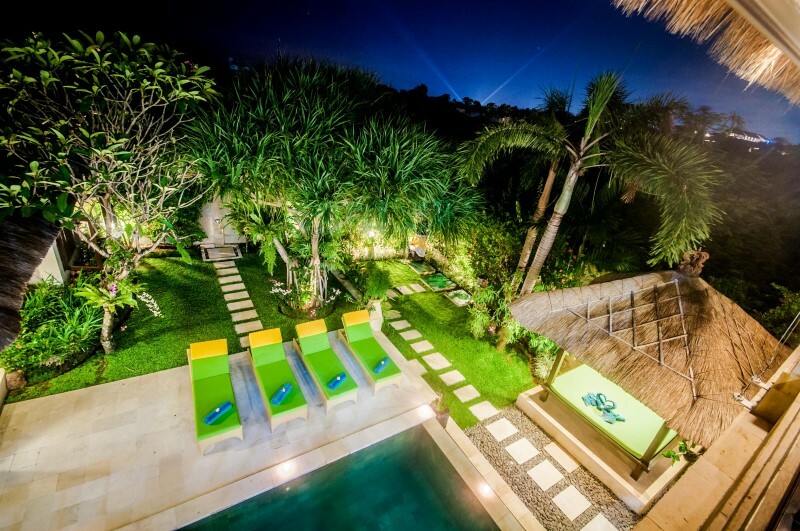 Loved the location and layout of Villa Gading. 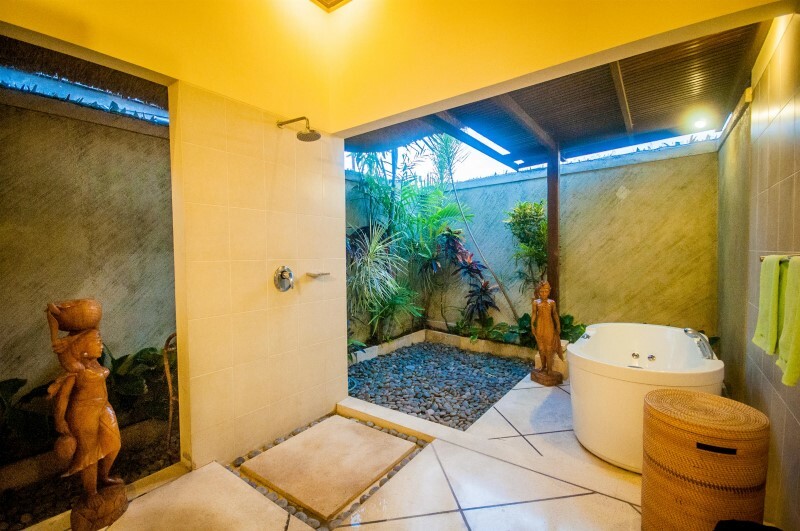 This was the 3rd Bugis property we have stayed at, and as usual the staff were brilliant. 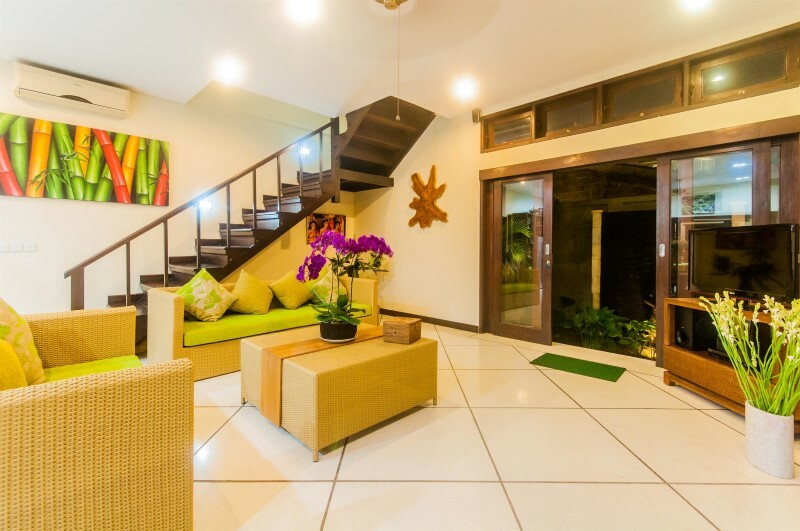 But what made Villa Gading our favourite so far was the location and lovely, quiet setting – it’s the last house at the end of a gang off Jl Drupadi and borders fields/rice paddies. The gang itself is not great to traverse after a downpour, but that was never an issue as we never really used it – we took the shortcut to Jl Drupadi at the back of the property, a 30-second walk. The spot where the shortcut joins Drupadi opposite the Destiny Hotel is perfect for hailing taxis (never had to wait for than a minute for one) and it is a very cheap trip to Eat St area (Laksmana/Oberoi) or Bintang Supermarket. 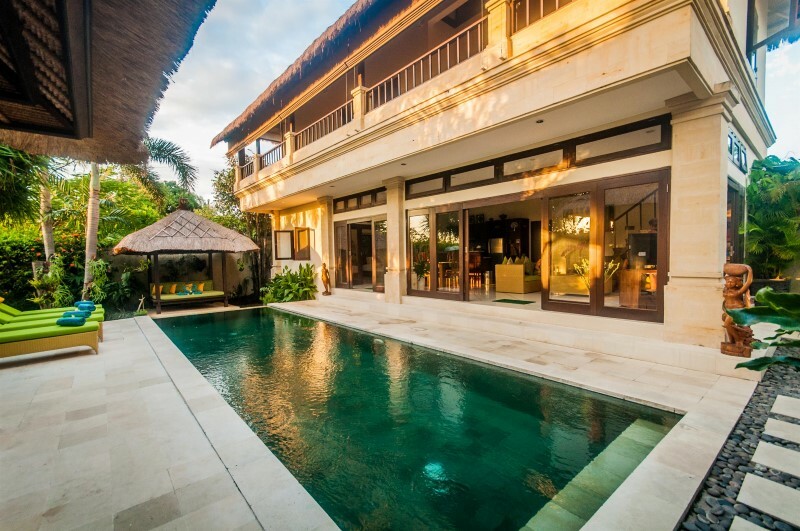 If you rather walk it is a 10-min stroll to Eat St, or the beach (but honestly the pool is way better and cleaner!). 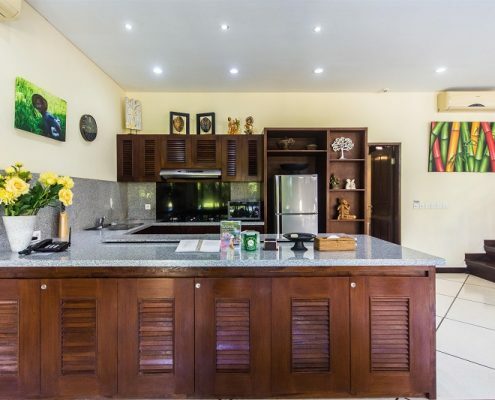 There are several Circle K/Mini Marts around the corner from the villa, as well as loads of restaurants, a really good bakery and plenty of spas. 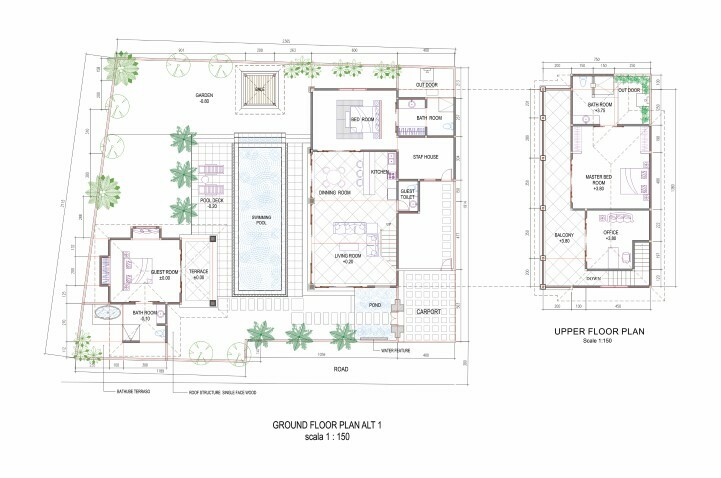 The villa itself was well laid out – the pool was shaded in the afternoon heat, and doors opening to the pool area can be completely closed, so we felt our kids were safe without the need for a pool fence. 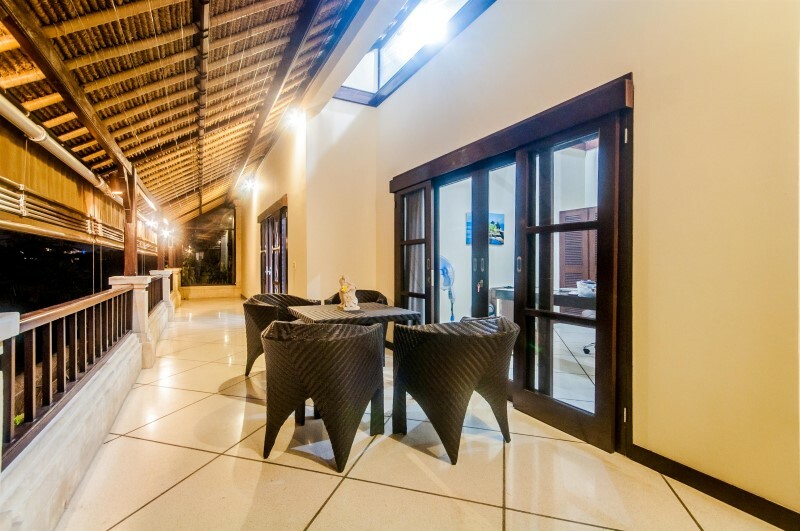 It also meant we could sit in an air con enclosed lounge area at night when the mozzies are active, an option many villas don’t have. Staff came to light coils in each room of a night, and wifi was fixed after we raised it. 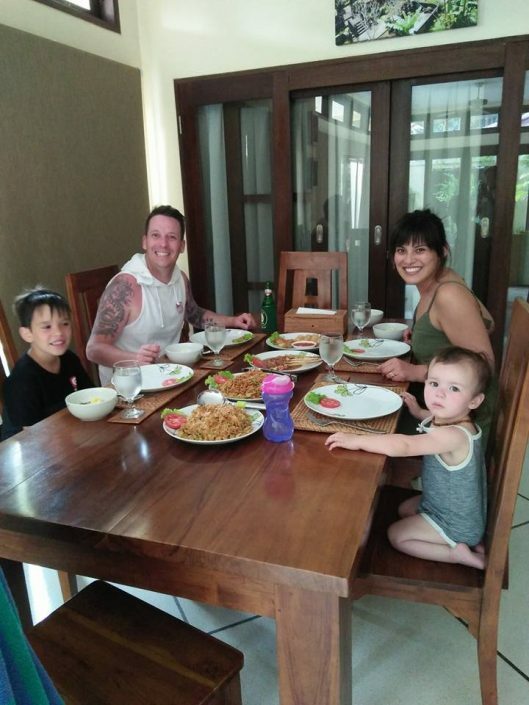 Stayed at Villa Gading recently with my young family and had a fantastic quiet holiday. The location is excellent, in a very quiet end of a street, backing onto a quiet field ( nice views from the balcony at sunset). 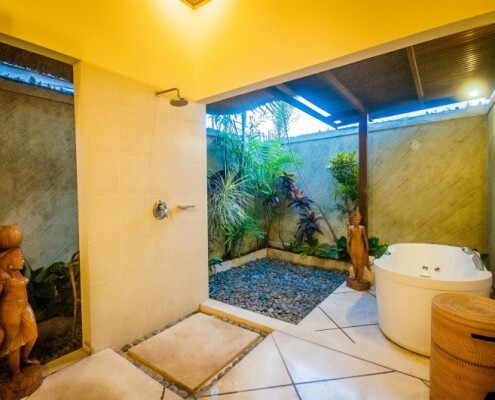 It is only a 20M shortcut, via the field onto Jl Drupadi from the front gate of the villa, 10 minutes easy walk to the beach and the same in the other direction to Jl Oberoi. 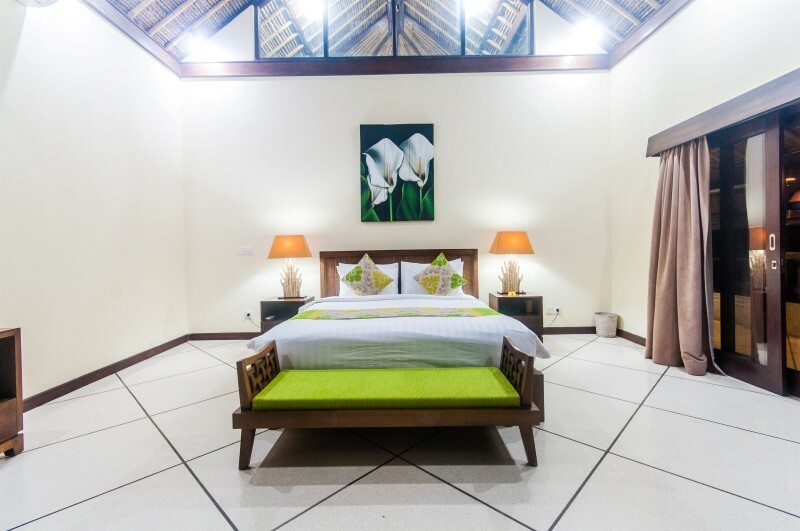 Clean rooms, great staff and fantastic pool and garden. We have stayed in other villas which were much noisier as they had other villas on all sides. 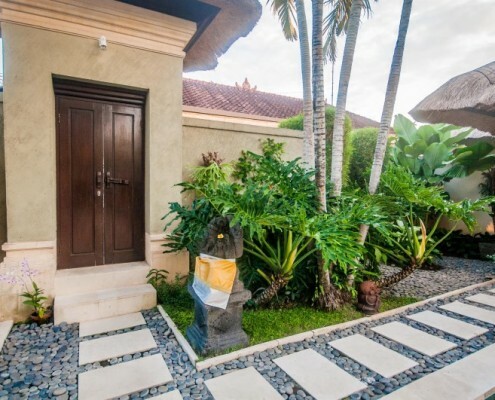 This one is very peaceful and good for young families as the doors to the villa can be locked from the pool and air-conditioned. 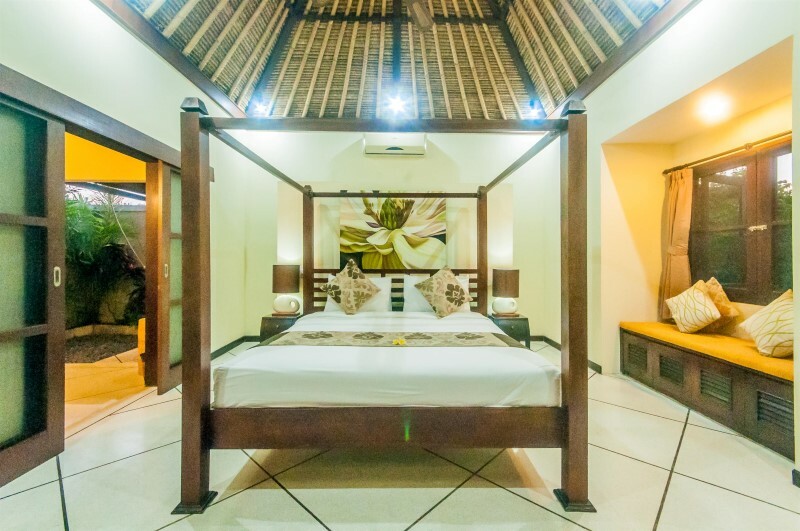 I would not hesitate to stay here again, and probably will. 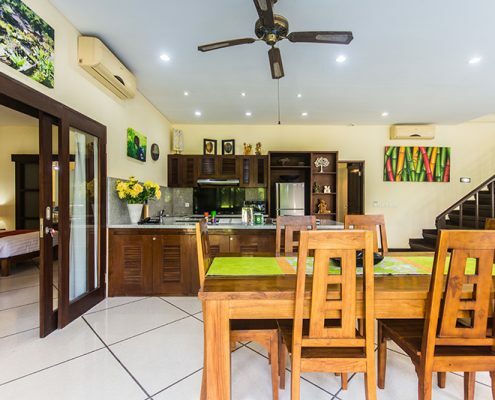 Great value for money considering the price of some of the other comparable villas, even within the Bugis Group. 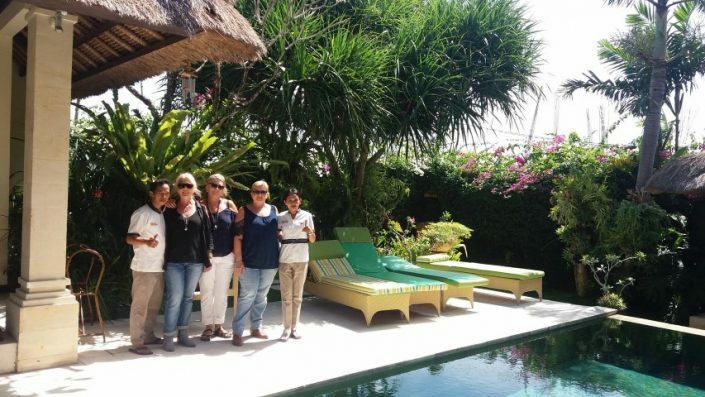 We were absolutely delighted with our recent stay at the beautiful Villa Gading. 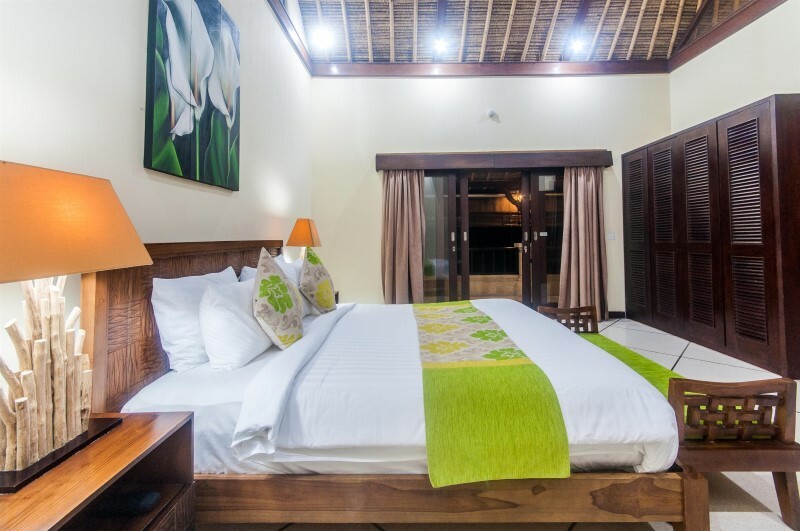 It was everything we wished for…a quiet villa in a good location, a lovely pool and one room with twin beds! The staff could not have been more helpful and courteous, the villa was always cleaned thoroughly the gardens were maintained to perfection. And the added bonus was the perfect weather in February! Thankyou all for our wonderful holiday and I hope one day to be back. 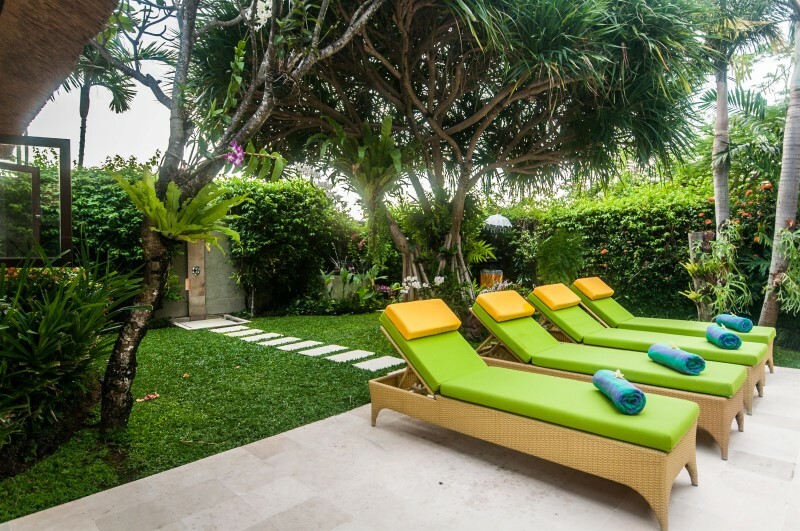 If you’re looking for privacy, security, proximity to restaurants and bars – and above all a little bit of luxury, look no further, Villa Gading in Seminyak is it! 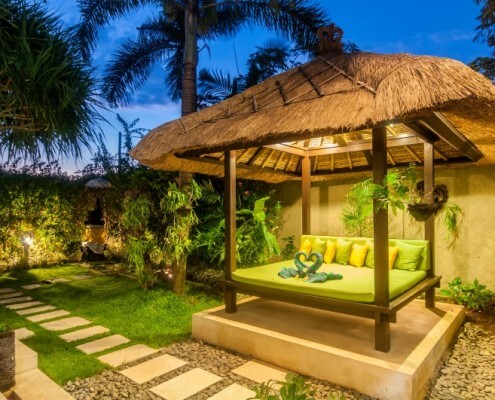 Owned and decorated by an Australian lady who has had a 30 year love of Bali and the people, it is the consummate place to take a break – but you need to be aware bookings are strong; because she loves it so much she spends a lot of time there, hence the very personal decorating style in keeping with the Balinese theme. 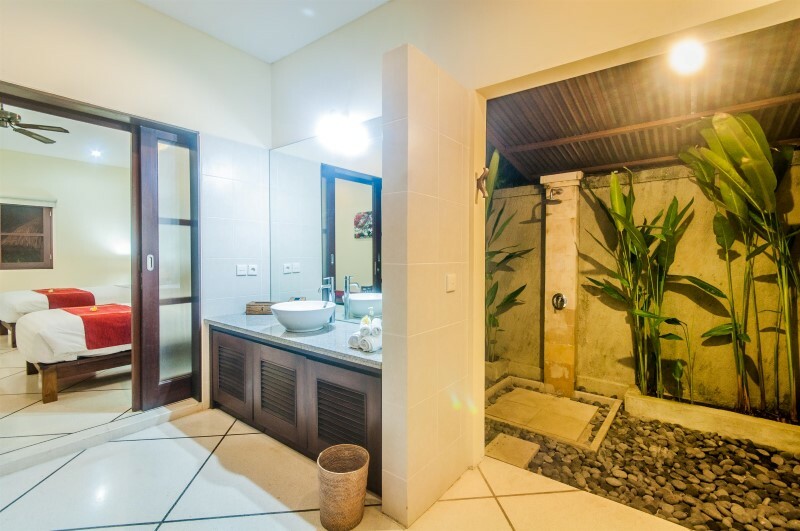 The bedrooms are screened and air-conditioned, the 3 ensuited bathrooms are all “open air” style and huge, the living area has big sliding doors, and if you want to have someone cook for you, Villa Bugis who manage it can also organise that. And it’s only 10 minutes’ walk to the beach where you can sit in a colourful beanbag and watch the glorious sunset whilst sipping a cocktail. 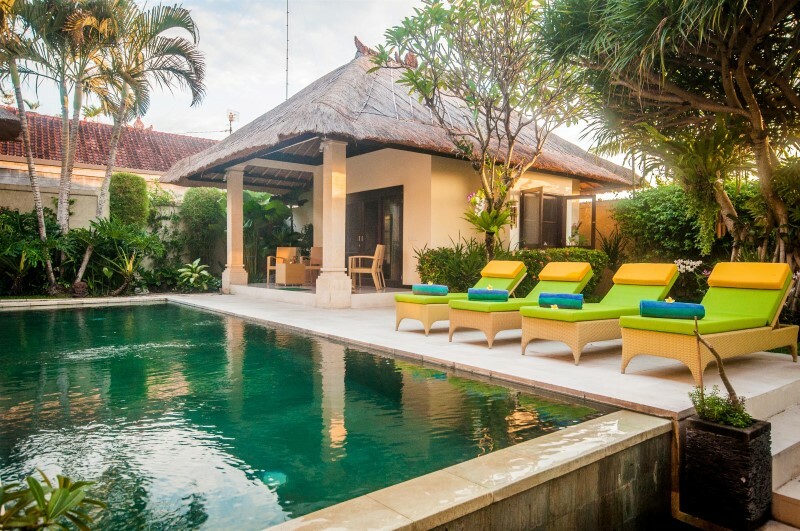 This Villa has it all – we loved our stay there! 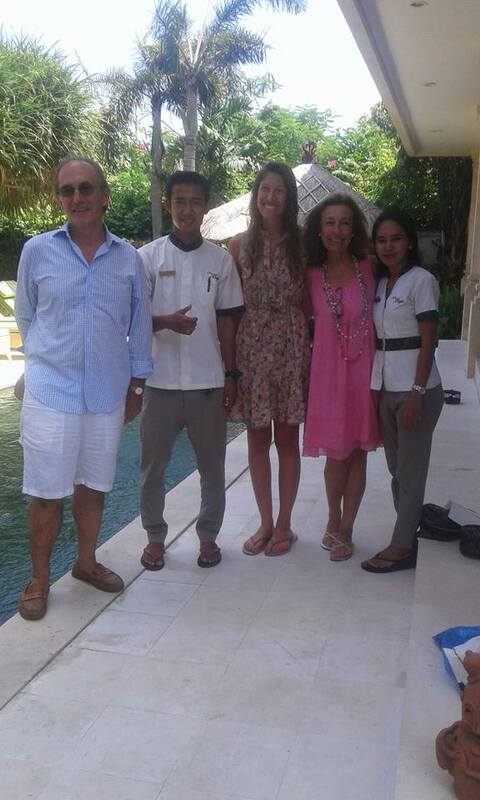 With great reluctance we have left Villa Gading after a great week. 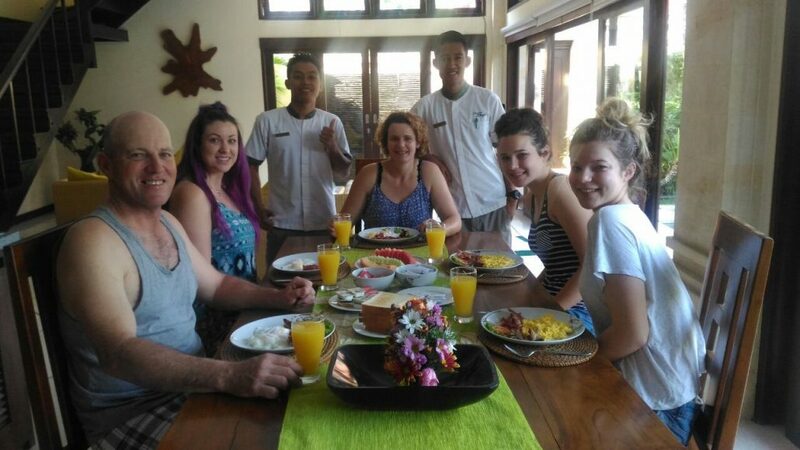 The staff that cooked us breakfast, picked us from the airport and kept the villa clean were fabulous. 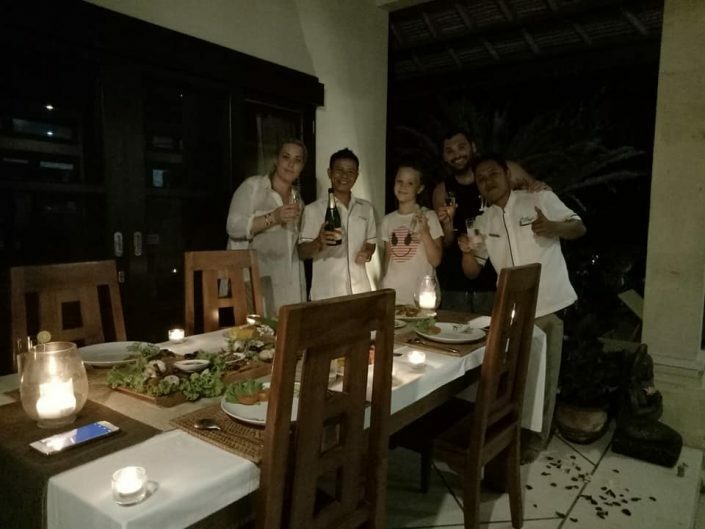 A big thank you to them for making us feel so comfortable and looking after us. 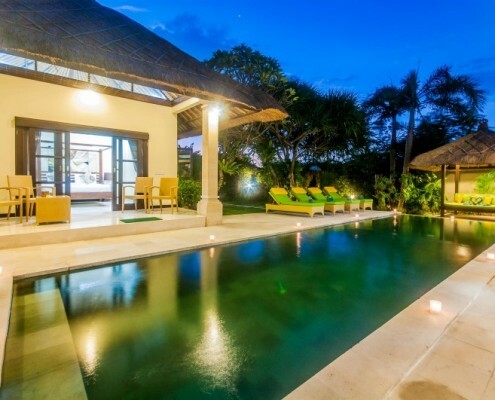 The villa was our little paradise. Close to everything but once we walked through the door to our villa – wow. It was awesome. 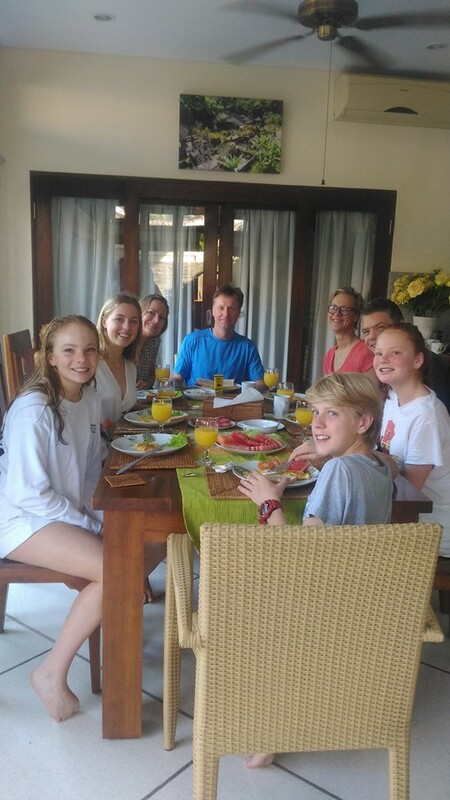 We have had the best week in Bali and have come home relaxed. 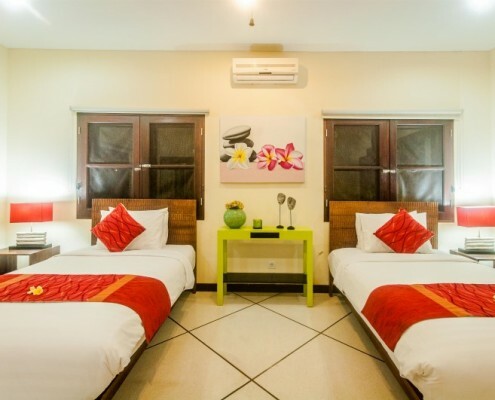 Would not hesitate to recommend or stay at Villa Gading again. 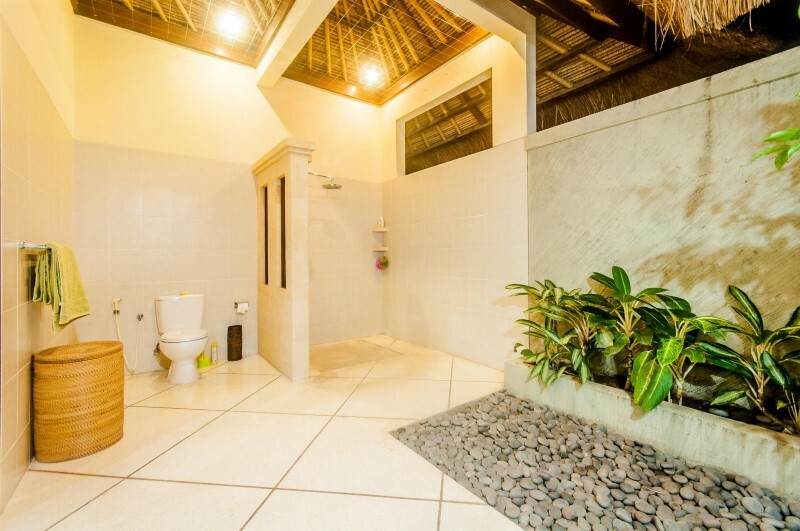 The villa was way over our expectation. 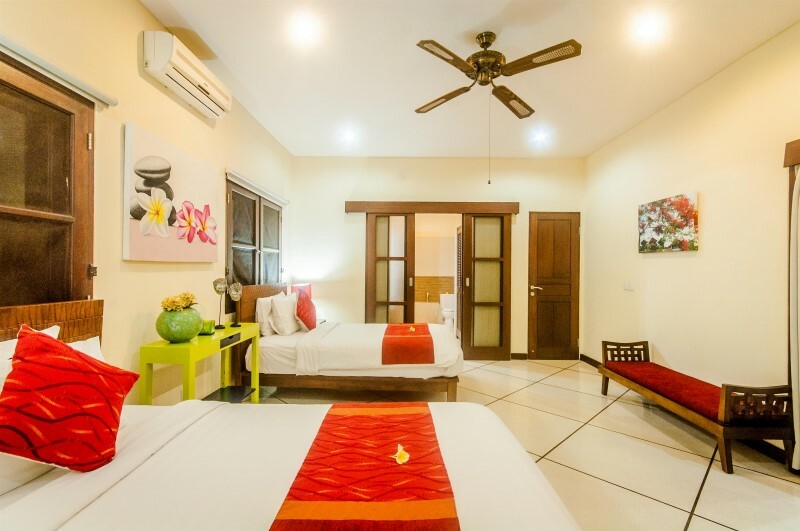 The modern decor and facilities definitely made our stay very comfortable. 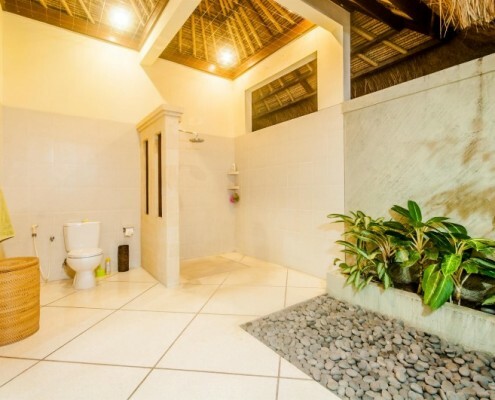 The staff was very friendly and approachable, so anything we need, we could simply approach them. 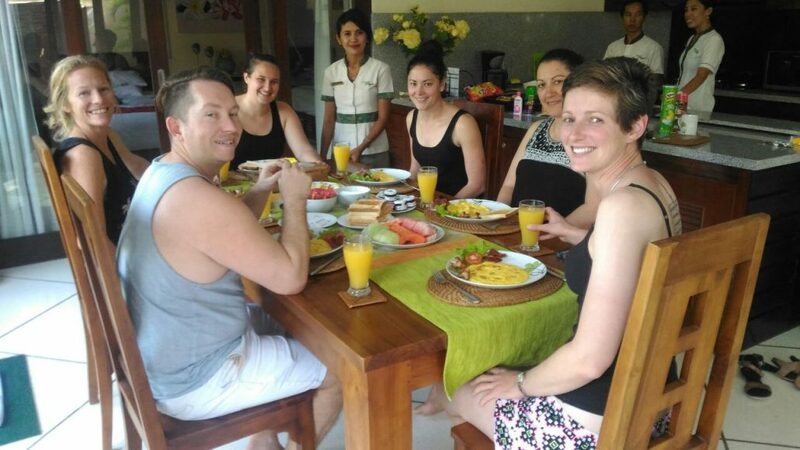 They made breakfast in our very own villa, which was a luxury. Definitely would recommend to everyone and a return here is a must !